Making a Gibraltar tour in one day from Marbella is simple and fun. Located only 45 minutes from Marbella the whole family will enjoy the sights and sounds of this famous rock. If you have already visited we would love to hear from your family! Gibraltar can be seen from the Marbella coastline and on a clear day it´s impressive. However, as you get closer to this peninsula you are even more amazed at the size and grandeur of this limestone rock called Gibraltar. Although technically a peninsula, many people see Gibraltar as an island. It is unique in that it signals the position of the Strait of Gibraltar, the narrow neck which separates Europe from Africa, and yet provides the only link between the Atlantic Ocean and the Mediterranean Sea. A sandy isthmus connects Gibraltar to Spain. There are also ferries to Morocco and flights to London from there. After repeated conquests and sieges, Gibraltar has been claimed a British Territory since 1704. Many tourists flock from the Costa del Sol to Gibraltar as it is very close and can make for a fun Marbella one day trip out with the family. How to get there: From Marbella take the main highway N 340 towards Algeciras. Continue straight and look out for signs as you pass Sotogrande. Exit at the Gibraltar (La Linea) turnoff and head towards the sea. You may either enter with your car or park in a parking lot in La Linea and walk across. Don´t forget your passports! If your ID card is a valid EU travel document for travel within in the EU, then you CAN enter Gibraltar using that. Gibraltar is part of the EU. Passports are needed to enter Spain and Morocco.  Legal tender is pound sterling and Gibraltar pounds.  Shops open 9:00am - 7:30pm during weekdays and half days on Saturdays. Most are closed on Sundays. There are several ways to get around Gibraltar. Your hotel may provide a Gibraltar tour from Marbella and this often provides good value, however you are stuck moving at the same pace as a huge group. If you choose to take your own car you can get around on your own, however it is prohibited to take your own car up to the Nature Reserve which is one of the most exciting attractions that Gibraltar has to offer. We suggest you take either a coach trip or a taxi Gibraltar tour as you will find your driver has loads of information and tips about Gibraltar that you wouldn not have otherwise if you were visiting on your own. Coach trips of a Gibraltar tour can be booked in advance and will take you all around the island. They cost around £15 per person, however you are limited to a certain amount of time. Be sure to ask how long your tour will be and which sites you will be visiting. Taxi tours are much more personal and gives you a chance to explore at your own pace. 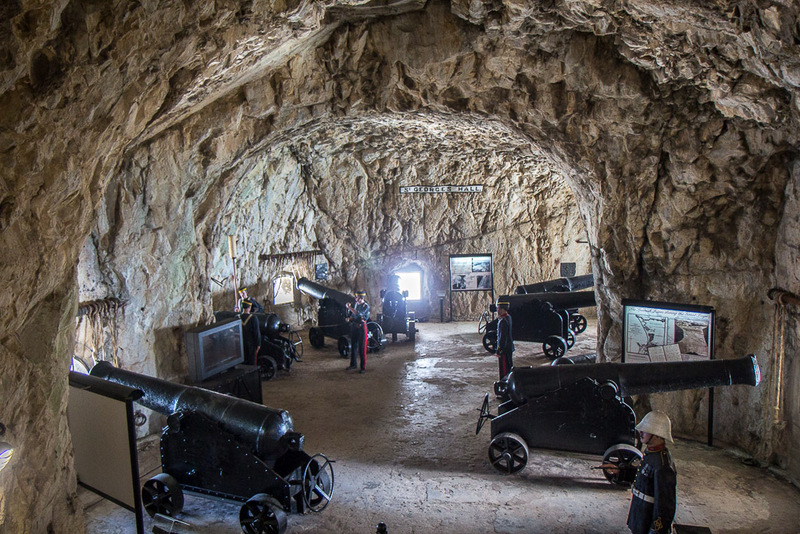 A Gibraltar tour cost approximately £14 per person and includes entrance to caves and tunnels. You may also visit the top of the rock of Gibraltar by cable car for only £7 return and £6 for one-way, however this does not include any entrance fees and you will have to do a lot of walking. (20 min. walk to the caves and 1 hour walk to the tunnels). Barbary Macaques One of the most famous things about Gibraltar is the Barbary Macaques. Descended from North African populations of Barbary Macaques, these little guys are the only primates within the whole of Europe that have the luxury of being able to roam around freely. Although, legend has it that if they go to far, and find themselves outside of Gibraltar, then Gibraltar will cease to be British…so whatever you do, don’t try and keep one as a pet! This is a great activity for the whole family, especially if you have little ones, and is located in the upper part of the rock. But remember, these are wild animals so always be weary that they might bite. 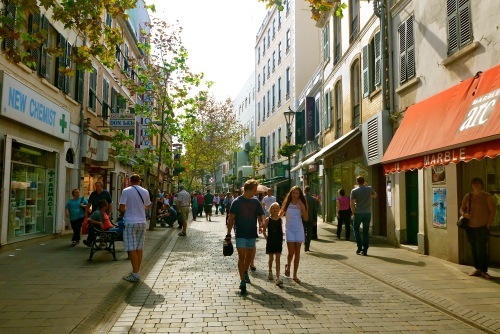 Tax Free shopping Gibraltar is an absolute haven for any shopaholics out there! The best place to go is Main Street, the centre of Gibraltar’s shopping district, where there are many shops to grab a real bargain. A massive addition benefit of shopping in Gibraltar is that there is no VAT, meaning that anything you buy here will be cheaper than anywhere else. On top of that, if you are visiting from the United Kingdom, you will be able to use your pounds sterling, so there are no costly currency conversions! You will find a mixture of shops down Main Street, to small souvenir shops where you can buy a monkey (not a real one), to big brands you would recognise from the English high street, including Marks and Spencer and Topshop. The Great Siege tunnels These tunnels were excavated during WWII when Britain was at war with Germany and Italy in 1940. In 2005, these tunnels were opened to the public and act as a testament to both civilians and soldiers who lived and worked in them during some of the hardest days of the Second World War. The tunnels make up a 32-mile network, and you can join one of the many daily tours to travel back in time and follow in the footsteps of some of the greatest people in British History. 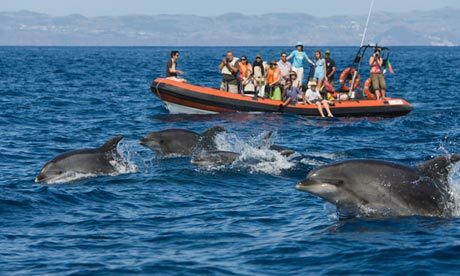 Dolphin Trip Many different species of Dolphins can be found around the coasts of Gibraltar and there surely is no better way to see them than taking a boat trip out onto the Mediterranean. There are many different companies that offer these trips, you may want to try The Original Dolphin Safari at Marina Bay. Remember, if you’re going in the height of summer is may be busy and be sure to take sun cream! Have a question or perspective on what it's really like to live in Gibraltar? Do you have a question or specific perspective you'd like to share regarding family life in Gibraltar? Visa needed for Serbian citizens to travel to Gibraltar? Can I get from Marbella to Gibraltar without a car? Train? Bus? What are my options? Around 200 million years ago, there was a great upheaval of the Earth that caused the shape of Gibraltar as we see it today. The top ridge is made out of compressed seashells, which were once at the bottom of the Ocean, whilst the rest of the Rock is made from Jurassic limestone. 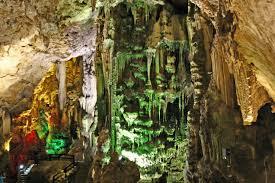 Due to the natural cracks in the rock, overtime rainwater filtered through and began to create huge caverns, such as St. Michael’s Cave, which is a major tourist destination today. These caverns became very attractive accommodations for prehistoric people, who lived here up to 120 thousand years ago. However, it wasn’t until much later in 711 AD that the Rock became a settlement for the first time. The Moslem general, Tarik ibn Ziyad, landed his forces at the southern end of the Roack and began the initial muslim conquest of Spain. 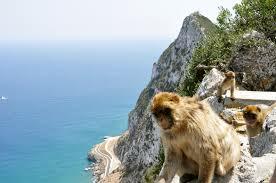 He named the Rock “Jebel Tarik”, meaning the “Mountain of Tarik” from which the name “Gibraltar” can be derived. Gibraltar remained in the possession of the Moors for 400 years, from the 11th to the 15th Century, in which time they made it their fortress and began to build, which explains the architectural style that is still prevalent in some parts today. However, in 1309, there was the first siege, in which the Spanish took possession, however this was not to be the end of the battle. Another ten sieges took place within the next 24 years, by which time much of the Moorish and Spanish architecture had been destroyed. In 1333, the Moors regained control by the end of one of the bloodiest sieges to date that had last 18 weeks. The Rock remained in Moorish control until 1462, when the Duke of Medina Sidondia of Spain recaptured it once again and returned it to the Spanish. Then in 1704, Sir George Rooke of Canterbury took control, with the help of 1800 Dutch and English Marines. The Spanish then gave it up, to the English under the Treaty of Utrecht in 1713. However, this was still not the end of the battle for the Rock. In 1779, the 14th and final siege took place, also known as the American War of Independence, in which the Spanish and French forces joined together in attempt to recapture this territory. The British forces were strong enough to defend the opposition’s many attempts and the Rock remained in British control. As bigger issues, such as the war against Napoleon began to arise, the fortifications at the frontier, connecting Spain and Gibraltar were demolished, allowing free access across the boarded, and enabling Britain and Spain to form as allies. This free movement began to let the two communities live in peace together, and in 1830, Gibraltar was declared a British Crown Colony, and later in 1950, Gibraltar’s first Legislative Council was opened, allowing Gibraltarians to vote for their national association. The results of the first referendum showed that there was an overwhelming desire to stay associated with Britain. This displeased the leader of Spain, Franco, who decided to close the Frontier in 1969 as an attempt to claim Gibraltar, although this was to no avail, and the Frontier began to reopen in 1982. 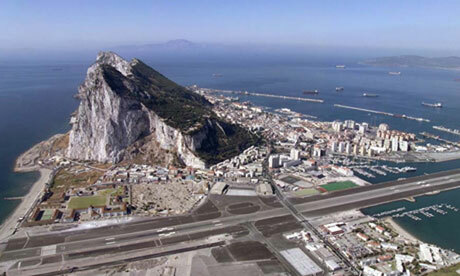 Today, Gibraltar is in the possession of Britain, with over 98.9% of Gibraltarians voting to remain British, as shown by a referendum held in 2002. To go there today, you will see many iconic symbols of Britain, such as the red post boxes, telephone boxes and of course, Marks and Spencer. It is a small place filled with an extensive history, and you should really go and have a look for yourself. Daughter's evaluation: I had a great time in Gibraltar. I didn't really enjoy the long car ride to get there, but it was worth it. We took a mini van to go up a mountain to see the monkeys at the top. On the way we passed this really nice cemetery with lots of different tombstones. The monkeys scared me a bit because they are wild animals that could jump on you, so thats why I don't like visiting the monkeys too much. If you bring food with you when seeing the monkeys you will have to put it away so they don't steal it. The restaurants in Gibraltar were pretty good. There are different restaurants with different foods. There is one dessert that was very good that most restaurants should have called banoffee pie. The weather in Gibraltar is quite nice but if you go in summer it can get really hot. Mom's evaluation: We had a great time taking a Gibraltar tour with the kids. We decided to go on a whim as the kids were asking for all these unique English products that their friends from school would bring from the UK. Our mission was to go to Morrison´s supermarket to buy things like string cheese and fruit winders. We left early as to get a head start and do a bit of touring before we hit the market. We spent a fabulous day visiting the city and taking a Gibraltar tour via coach trip. We stumbled upon a stand by the cemetery where there was a mini van waiting to pick up tourists. We agreed on a price and waited for a few others to join us. We heard about the monkeys in Gibraltar and this was the way to see them. We first took a pit stop at the Pillars of Hercules where we got out to take some pictures of the spectacular view. We then carried on towards the top where we got to the monkeys. My daughter freaked out when she saw them and didn´t want to get out of the car. We eventually coaxed her out and took some photos. Be careful not to have any food nearby as there was a tourist who had a candy bar hanging out of the side pocket of his backpack and a monkey just came up to him and took it out. This not only can scare you, but it´s not good for the monkeys to eat chocolate or snacks that we humans normally eat. Our Gibraltar tour continued on to St. Michael´s cave with its beautiful rock formations of stalactites. It was nicely lit to give an interesting effect. This also kind of freaked out my daughter who was 7 at the time, however my 9 year-old son liked it. My kids had a ball running through the Great Siege Tunnels, which through mannequins,props and voice overs gives you the impression of what things were like during the Great Siege of 1779 which lasted till 1783. We managed to squeeze in some time to visit the Gibraltar Museum, have fish and chips for lunch and do a bit of shopping on Main Street. The kids thought it was so funny to see double-decker buses and bright red English telephone booths all about. They enjoyed our visit to the candy store and Marks & Spencer. The highlight for them, however, was the shopping at Morisson´s picking out all sorts of goodies that we don´t normally find in Marbella. There can be big queues getting in and out of Gibraltar which can take up to three hours, so avoid peak times entering and exiting the frontier. If you do encounter a big line you may park at the parking area located just in front of the frontier and walk across. There is lots of transportation available once you cross. It´s an excellent opportunity to get the kids on a double-decker bus if they´ve never been on one before. All in all we had a great time and felt like we just stepped out of Spain for the day. However, personally if you´re here to visit Spain, I wouldn´t put a Gibraltar tour at the top of the list of things to see and do in Marbella, unless you´re like my father who always wished to go to the Rock one day just to say he´s been there. If you´ve only got a day or two extra to see sights outside of Marbella I´d sooner go to Granada or Seville.